Mother’s day is a time when children (and adults) all around the world want to show the women in their lives who have taken care of them and loved them, how much they mean to their lives. Often times we think of buying jewelry, expensive lunches out and spa gift cards which are very nice – but mom is sure to love anything if there is thoughtfulness behind it. Let’s spoil mom this Mother’s Day! I always say that a mom can do anything if she has sleep under her belt. Surprise your mom by allowing her a few extra minutes of sleep on Mother’s Day. She’ll wake up refreshed and love you for it! 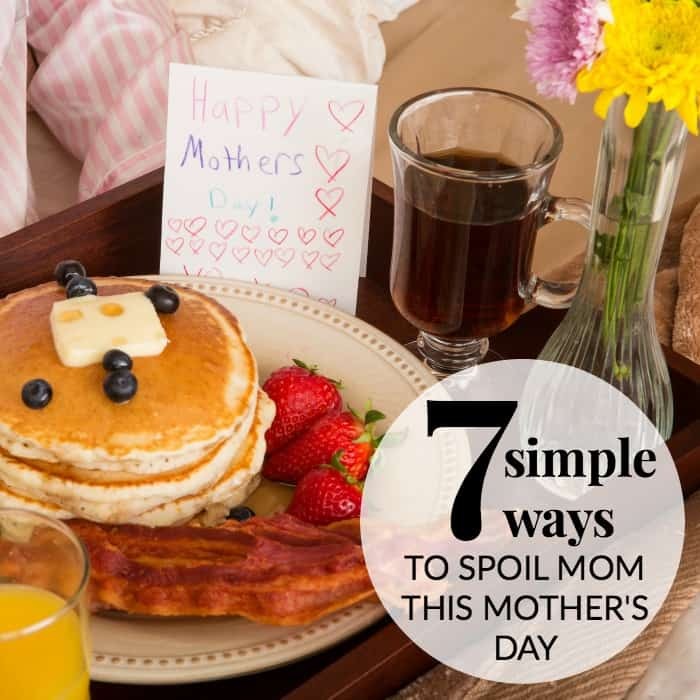 Find out what mom’s favorite breakfast is, and make it for her so she doesn’t have to lift a finger. This is a great way to spoil mom because children of almost any age can help if not complete this task on their own. There is always that one movie that you hear your mom talk about and hear her sing songs from. Even if it isn’t your favorite genre, or even if you’ve seen it 100’s of times, offer to watch it with her again — without complaining! Make a coupon book offering to complete chores around the house. From sweeping the floor to cleaning up your room, any mom would love a cheerful chore-doer. You can also buy a pre-made coupon book here. Run a nice warm bath for your mom allowing her to rest and relax. Light a candle to give it a true spa-like and add some bubble bath, bath bombs or these great DIY Bath Salts. I know that I love to have pictures of me and my kids. And every Mother’s Day I request a photo shoot without any complaining. Grab a camera and do a fun photo shoot in the backyard or at the nearest park. Your mom will treasure these photos forever. It may sound simple, but your mom loves to be cherished and would feel like a queen with a genuine hug from you! Are you looking for a high-end gift? 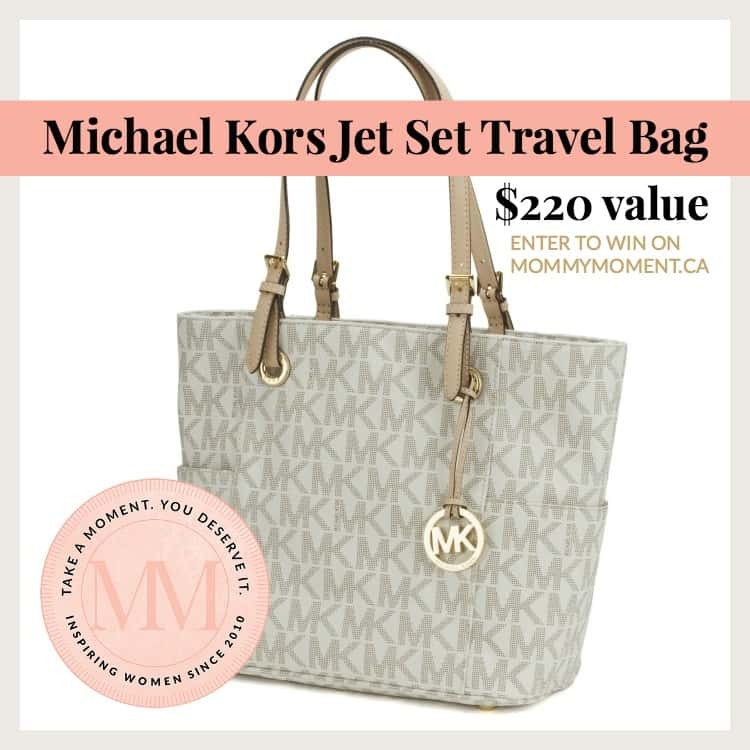 Check out this Michael Kors Jet Set Travel Bag – we previously gave one away on the blog. The contest is over now. Mom is going to love carrying her things in this designer bag across the country or just across town! This vanilla color bag features the Michael Kors logo pattern on the exterior and lining and has roomy compartments on either side. This fashionable tote measures 10″H x 15″W x 9″D and with the zippered closure, ll your belongings are safe inside. Truth: I don’t think I ever truly appreciated my Mother for all she was and all she did for us until I myself became a Mom. On top of her super woman qualities she Mothered twins, my brother and I. My LO is 17 months old and I’ve asked her many times lately how she survived twins! I was so scared and nervous becoming a first time parent of just one and at a much later age in life then her as well. I can only imagine her strength! So here’s to her and Michael Kors. May she travel the world in style all the while knowing just how much she’s truly loved! And if by chance I don’t win for her I shall make her a coupon book 🙂 Thank you for a wonderful post and giveaway! Happy Mother’s Day to you! Mom deserves to win this Michael Kors bag because she could sure use a new one. My mom never buys herself anything new – she would love this! My mom was a single mom and has sacrificed a lot for me. She deserves the best & I would like to treat her for Mother’s Day. It is a beautiful bag and she should be pampered. Both my mother and mother in law are gone but, I have an amazing cousin who I lived with for a few years. She and her family were great \. My mother deserves this because she never buys herself anything so nice, she is always looking out for others and forgets about herself!! My mom deserves this Michael Kors bag because she has never owned a nice bag all her life. She has always said she would much rather spend money on her kids and family than getting something for herself. She has always put us before herself. She is one of the most selfless person I know and is always thinking of others. I am who I am today because of her. My mom deserves to win this bag because she helps me out with my boys on a daily basis. She never expects anything in return for all that she does for us. She also doesn’t buy herself new things too often because she’s always thinking about the needs of her family. My mom, who I still think of daily, was the funniest and smartest person I have every known. Dad died when I was 9, she was 42 and had 5 kids aged 9-18 (3 teenage boys!) How she managed financially I can only imagine, times were VERY tough! Through it all she taught us the really important things in life – enjoying yourself and finding the humour of pretty much any situation and spending time with those that mean the most to you! She has since passed on and I miss her terribly, even though she couldn’t win this for herself I know that she’d love to win it for me. We were best friends, we travelled the world together as adults and had many, many laughs together. We used to say that “Every day was Mother’s Day”. Cheers. She is an older woman and fashionable in every way, except her bags and purses…..this would complete the package! My mother was my inspiration and my strength. I felt like I lost my reason for living when Mom passed away on October 3, 2010. I won’t lie…I lost my way. I felt like nothing I could ever do would be as wise or as wonderful as my mother did, and I was broken-hearted for my own children, who helplessly watched their mother sink deeper and deeper into despair. Thankfully, I eventually found my way back through my grief and realized that all the love I wished I could give to my mother I could shower on my children and other loved ones as well. The memory of my mother’s love and guidance helped me to become a stronger, wiser mother myself. Of course, to this day, I would give anything to be able to hug my Mom just one last time, so instead, I hug my children, and fill their lives with stories and memories of a grandmother who loved them beyond words. Happy Mother’s Day, Mom! My mom is not here …. but …… I know she would love me to win this. I have to say that my mom really loved purses. She had many. She also loved perfumes, body washes…… spoil me things. My mom has three daughters and we haven’t always been the easiest to raise. She does so much for us and for others and deserves a treat. My mom is so generous to her grandchildren & myself, she is always putting others before herself. She really is my best friend; she never spoils herself so this would be such a lovely treat for her to own a designer handbag! My mom replaces her purse once or twice a year. She would love this bag and she deffinitely deserves a beautiful new bag! My mother deserves to win this Michael Kors bag because she was a single mother of 4 kids. Not only was she a single mother but she also went back to school to get her degree. But one wasn’t enough she went back and got 2 degrees and also cleaned houses to make extra money to feed her kids. She is the best person I know, without a doubt ! I think my mom deserves this bag because she has given up everything that she has ever wanted and needed to ensure that my brother and I had everything. My mom doesn’t have much money and could never have a MK’s bag as she would never treat herself to one. Because she rarely buys anything for herself and would love a new one to replace her decades old one! My mom has always done everything she can to take good care of me, including juicing most of the day when I was bedbound on a liquid diet. She makes sure I know that shes here anytime I need her! I’d love to win it for my God Mother. She is a wonderful woman and despite all the hardships and loses she had in her life she manages to stay positive and encouraging. It would be awesome to win – this bag is totally in her style! I am writing this on behalf of my two boys-who feel I deserve this because I am a good mom who does everything for them out of love. They would like me to have this as a gift from them for Mother’s Day. Sadly my mother has passed so Mother’s Day is very bittersweet. I would love to win this for a special lady in my life -my best friend Dianne who has been a great support for over 20 years. my mom has had the same purse for 10 years! time for an upgrade! My mom would never have bought anything so extravagant for herself, but she surely deserves it. i don’t mean to be selfish – but this is the nicest bag i have ever seen – and if i won, honestly, i would have to gift it to me! I deserve something nice, right?! My mom deserves this gorgeous bag because she has been the best mom ever. My family and I were going through quite a bit for the past year and she has been by my side throughout. On top of that, she never splurges on herself so I would love to gift her this bag. My mom deserves this because she is amazing, loving, and smart <3 She is currently dealing with taking care of her mom who has breast cancer and is going through chemo and I know this would brighten her day! My Mom has 8 children, 19 grandchildren and 15 great-grandchildren and is turning 95 years old on October 30th. Mom is an inspiration to everyone that knows and loves her because she’s thoughtful, kind, and generous. She never buys anything for herself and she would LOVE this gorgeous Michael Kors Jet Set bag! My mom loves purses and would love this purse, she has had a bad year losing my dad in the past year and this may cheer her up a bit even though it’s just a possession. My mom never gives up. She works hard and would drop everything to help friends and family. She doesn’t get to spoil herself, and this would make her very happy. Though I know she would truly be happy with a hug, I would love to give her something for herself. Because every mom should be pampered for Mother’s Day! My mum has long since passed but I am a mum and grandmother and could really use a new handbag and this one is beautiful. My mom deserves this MK bag as she is a great mom and would never dream of buying a designer handbag. Mom deserves to win this Michael Kors bag because she never buys herself anything new. She is selfless and always puts everyone else in front of her own needs. She is an amazing lady who definitely deserves this!! Because my mum is selfless and epitomizes patient maternal warmth. Even in my young adulthood she remains my rock and best friend! My mom just won her second battle with breast cancer so she deserves an extra special treat to celebrate. My mom (and dad) do so much to help us with our son – we’re truly spoiled. I’d love to give her this as a thank you. It’s gorgeous. Because my mother is the most hospitable person I know. She always serves, and she would never splurge on something like this herself. My mom is the best you could ever ask for. Always there for you and always putting every one else first. She deserves this bag to make her feel fabulous. Thanks! Because she has experienced a lot of loss in this life and is currently a widow! She strives hard each day to be positive and excited for life and take care of all of her kids! My mom raised 7 children and everything my parents had went to us kids. My mom is the most unselfish person I know and I would love to give her this as a thank you for everything she has done for us and I know she would never splurge and buy this for herself! My mother passed away 4 years ago , but I would have loved to surprise her with this bag because she was always there for me and never pampered or bought herself anything. She always put others needs and wants before her own. This would be perfect for my Mum as she really needs a new bag but doesn’t very often treat herself due to lack of cash , the compartments would help her keep things organised! My mom always puts herself last and she deserve to have a beautiful purse! My Mom desires this prize as she is alway there for me growing up and is now my best friend. My Mom deserves it as she’s had a rocky 6 months. A fall resulting in a cracked hip lead to the discovery of lung cancer. This would be a lovely bag she could keep all of her important things in, especially for trips to the hospital. my mother always buys the cheapest bag and wallet possible due to her lack of funds. what a treat this would be. I’m the Mom, I deserve this bag. Actually my mother passed away over 4 years ago. I’d use this bag in her memory. My mom deserves this because she does so much for everyone – her friends, family, staff etc. She regularly takes care of our kids for us, and has a purse obsession, so I would love to treat her with this bag! She has always been there for me no matter what. She’s been a wonderful role model and I’m lucky to have her. My mother is gone now but I”d love to win this for my deserving friend who is the most wonderful and understanding mother and grandmother there is! She is always there for her family and never thinks of herself first, rearranging her scheduled days to help out in any way! If I won this bag I would give it to her, she deserves it and it’s time someone gave back to her! My mom deserves this bag because she is the BEST mom in the world and she does everything for me. She is also always complaining about her purse and how nothing fits inside. LOL She’s got too much stuff! My mom deserves this because she’d never spoil herself like this! because she’s awesome! my mom works super hard and is always thinking of other before herself. I think my Mom deserves it because she has been through a lot and still is so kind and helpful. My mom deserves it because she is kind and loving. She has taught me a lot in my life. My girlfriend is currently pregnant with twins and as a mom to my three other kids I thought she deserves this bag for all of the work she puts in to our family and it would be a nice surprise to keep her happy during the last months of her pregnancy! My mom deserves it as she has sacrificed a lot and is always there for her 4 kids plus she loves fashion! my mother deserves this because she never spoils herself, always tries to spoil others, especially her children and me. Both my mother and mother in law are passed on now but I have a daughter in law who would go crazy over one of these bags. My mom never buys herself new bags even though she loves bags. I would love to give this to her, she deserves it! My mom is passed away for 20 years now,,if she was alive,,she would deserve this and a million things more!.. I also think I deserve it,because I do not buy things for myself very often! I would love this for my mom. She deserves it and she never spends a lot of money or treats herself. My mom deserve this Michael Kors bag because she deserves some nice. She’s always put others needs before hers. My mom doesn’t have anything fancy, her current leather purse is all ratted and falling apart. My mom deserves to win because she does everything for EVERYBODY and NOTHING for herself. She beautiful inside & out. Every extra penny she has goes to her children, grandchildren AND great-grandchild!!! I want this for my daughter. She is a single mom of two girls and gets no finacial help from her ex and she workks hard to suport her family. My mother deserves to win this because she spends money on others but never herself. My mom is no longer with us but my sister deserves this because she has always been like a second mom to me and will do anything for me. So it would be nice to treat her with this. My Mom needs all the pampering she can get right now having lost my Dad just before Christmas and dealing with her loneliness and sense of abondonment. I would love to gift her with this special bag. I would love to give this to my mother-in-law. She never treats herself to anything. She would be so excited about this!!! What a beautiful handbag to put some of your gift ideas inside! My Mom has always gone without, so that we could have more as her children. She has fine taste as well for classic fashion and beautiful things. 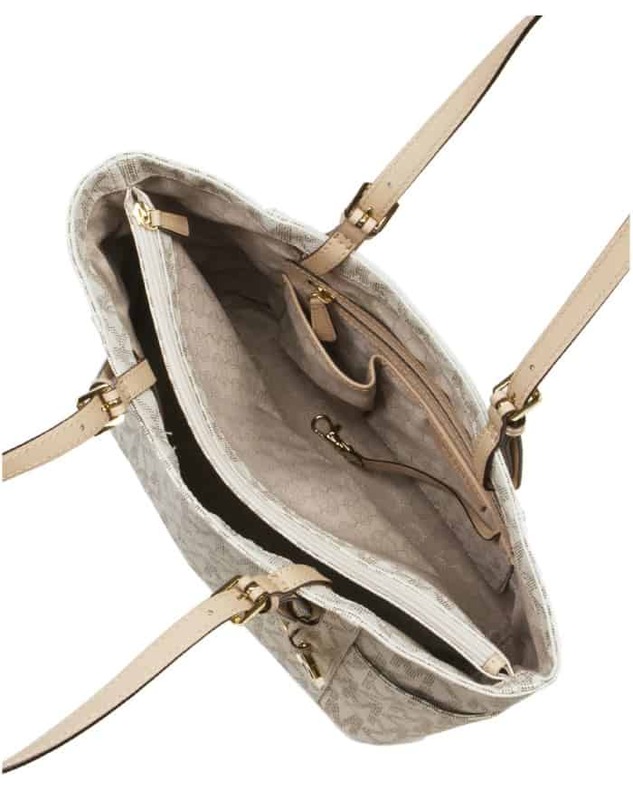 This bag would be wonderful for her, a bit of luxury on her limited fixed income. My mom isnt’t around but the bag is gorgeous and I am a mom. My mom has way too much stuff crammed into her tiny purse. She needs to win this roomy and gorgeous Michael Kors bag! My mom is the best. She dropped everything when I went into labour and was by my side for 4 whole days. My mom has been alot in her life & still goes on living life to the fullest & happy. She takes of young children everyday plus has suffered with MS for more then 15 years now. She is strong, confident and loves life. Unfortunately my Mom is no longer with me…..but I am a Mom and I love this bag!! I would gift it to a Mom I know as my Mom is not with me anymore. My mom deserves this Michael Kors bag because she is always there for me, offering help and advice. Thanks so much for the chance to win it for her. My mom deserves to win this since she does so much for me and she would enjoy having a really nice bag like this one. My Auntie (Mom) deserves this beautiful bag because she never buys anything nice for herself. She always spends on helping others. I would love to give her something Truly special. Thanks for the chance. My Mother is a gift from God-an angel sent here to give love to everyone. My Mom deserves this Michael Korrs bag because she never gets anything nice for herself. She always put everybody first. She has never owned such a expensive purse in her life ! My mom is the most amazing , giving person that I know. I would love to be able to give her something for all the wonderful things she has done for me. My mom does so much to help me, my sister and my nephew, and never asks for anything in return. My Mom would love this because she never buys herself anything indulgent! My mom rarely buys anything for herself. She is always focussed on making others happy that she barely ever treats herself to anything swanky, like this bag. My mom would never in a million years spend that kind of money on herself! I would love to win this for my daughter who is a fantastic Mom. A beautiful bag like this would be a real treat and she deserves it. My mom would love this bag. She’s always there for us & this bag is classy, just like her. My mom would love this as she’s never owned anything Michael Kors! My daughter who is a a wonderful single parent mom deserves this bag as she works 2 jobs, volunteers and has 2 young school age children. She is always there for friends or family when needed. My mom deserves this purse because she only has cheap purses that seem to fall apart so quickly and with this purse it would last longer and she would be the envy of all her friends. My mother would love this bag. She has been my best supporter throughout my life and has gone above and beyond the requirements of being an outstanding Mom. My parents are also celebrating their 50th anniversary next weekend and this would be a great treat for her as she has done so much with so little throughout her life and this bag would make her feel extra special. My mom deserves this prize because she recently lost her job and money has been tight so she has not been spoiled in awhile! My Mum is amazing, but I never realized it until recently. She always makes everyone feel special, welcomed and fully loved through her sheer presence. She loves quietly, but unconditionally. And she is always in my corner. My mother is one of the smartest and kindest human beings I know. She asks for very little – just for her kids and grandkids to be happy so she deserves the best! what a great giveaway! My mom helps me out whenever she can, and is an amazing grandmother. My mom deserves to win this bag because she’s deserves to have something nice to call her own. She’s a single mother to five kids so she’s doesn’t get to spend much on herself so this would be amazing! She’s a super mom and deserves to be spoiled this coming Mother’s Day! This would be great for m Mom for when she is traveling to Florida each year. She has had a bad year this year worrying about my stepfathers health. She just brought me back new sketchers and a purse from her vacation. She is so generous with me I’d luv to do something back. My Mother was such a lovely, kindhearted and loving person. She always sought the good in people. She was so supportive to myself, my 4 siblings, my Father and her own Mother, Aunts and siblings. She dedicated herself to ensuring that my Brother with Down’s received all the care & support he needed to be his best, at a time when there was little set up, little available and many with Downs were still institutionalized. My Mom passed several years ago so although I cannot win this for her, I can win it for our family friend (past baby sitter) who is very like a Mom to me, very deserving of this treat and the mother of boys who sadly, rarely come by. I’d love to brighten her day! My Mom deserves this bag because she never buys herself anything! She works very hard at an age she should be retired and still would rather see her family happy than her…she deserves something special! She always mends all my clothes…still. Even though I’m a mother myself now! My Wife would look great with this bag and she reallllly needs a new Bag! My mom has never had a fancy bag like this – she’d love it. My mom is always buying things for everyone else so she deserves a special treat like this lovely bag! She deserves it because she never splurges on herself! She deserves it because she’s never had a bag as beautiful as this one. My Mom deserves this as she is willing to anything for anybody and does not expect anything in return. My Mom deserves a new Michael Kors Bag because she has never purchased a brand new bag for herself before, she always gets her purses/bags from the thrift store and I think she truly deserves a brand.. spanking.. new bag.. Just For Her!!! Thanks for the chance to win Jody. I am so glad and thankful to take part in these competition, to whoever will win a big CONGRATS! my mom deserves this because she watches my kids every single day while I work and she never ever complains about it. She also drives my oldest to her gymnastics class after school and feeds my kids. She has helped me so much while I was a single mom and never asked for anything in return. I would love to be able to somehow pay her back. This would just be such a small token of my appreciation for her. My mother deserves this bag because she is an awesome and beautiful person. The main reason I want her to win this is because she is the financial planner, prime grocery buyer and balance budgeteer and she aside from her beauty bag she keeps all cards, receipt and lists in her bag so she needs a good and versatile MK bag for sure. I would love this bag for my mom. She does so much for everyone around her and she deserves nice things. My mom is 83, raised 8 children, lost one, grandmother to 14 and 4 great-grand. She still a very active senior and it pass the time she has something very nice for herself. My mom does so much to help me out, she deserves something luxurious! My mother is an amazing woman! She has a saying, “Once a mother, always a mother”. She would love to have this handbag. She’s the best mom and she loves Michael Kors! My mom deserves this because she’s a beautiful person that needs a beautiful bag. My mom is no longer alive, but I’m a mom. I would love to own something nice and new and not from a second hand shop. My Mom passed away a few years ago so Mother’s Day is a bittersweet day for me. I do have a few sisters that are Moms to my cool nieces and one of them would love this bag. My Mom would never spend money on herself! She gives of herself daily – from driving 2 hours one way to see her Dad (91) every other week to take him to appts, grocery shopping or just for a visit for the day to watching my girls at a moments notice, to having friends and family stay with her when they’re in a bind or travelling too far from their home for work. My mom is always so thrifty on herself but gives us so much. I want her to have something nice like a brand new brand name bag! My mom works really hard – she still packs lunch for my adult sister and keeps the household in order. My Mom always made sure I had everything I needed to get through school and also have those things that were special to me. My mama taught me unconditional love. She gave up so much, and always had a smile on her face. Nothing was ever hard for her. Her job was physically demanding, and then she worked hard at home. My mama always believed in making everything from scratch. She always says that it’s not only cheaper, but healthier. I’ve learned so much from my mama. The only way she would accept being pampered is by me gifting her a winning prize. Thank you for this generous gift. My mom has been buying purses from thrift stores for as long as I can remember. My mom always makes a point of coming to help when I need it and also to come visit me. She always has something fun in her purse for the kids, like coloured pens and notepads, treats, small toys in little tins… she can entertain my kids and I even when we end up waiting for hours in a hospital! My Mom is so generous with her time to anyone who needs it and would help anyone. My mom deserves to win this because she is always going out of her way to help everyone. She has the biggest heart in the world out of everyone I know. She is always there to help me with my 2 special needs children. She has never in her life owned a designer handbag. This would be an amazing feeling to be able to give her something so beautiful to be able to hold our pictures in her wallet in. Thanks for the chance to win. My mom deserves to win this because she never buys anything for herself, especially “brand name” items!! My mother would adore this! She works so hard taking care of others. Any mom would love to be spoiled with this Michael Kors bag :). My mom almost never buys things for herself and she deserves something so special! My mom always puts others first, so it would be nice to treat her to a gift as beautiful as this. My mom deserves this awesome tote because she always puts everyone’s needs before her own and is the best mom and grandma there is! My mom is a mother to five girls! How she did it, I have no idea. My mother has always put her children and grand children before herself. She has molded us into the women we are today and I appreciate all that she has done for me. Love you mom!!!! My moms deserves everything. I wish I could give her everything. But I tell her everyday how much I love her and how much she has done for us. The bag is beautiful ! I find it hard to spend that kind of money on myself. My mom would never splurge on herself which is why I would love to win it for her. My mom never buys anything for her self any more. She is putting both myself and my brother through university. She has been nothing but supportive in everything I do, and I know I can always run to her if I need anything at all. She deserves this tote because she shows so much unconditional love and asks for nothing in return. My mom deserves to win because of her generosity to others. She is always baking for friends and family and ready to lend a hand when needed. She is in her 80s but you would never know it as she is always on the go. I’m pretty sure that my mom has had the same bag for years and years – this would be a perfect gift. My mother successfully battled breast cancer and has always thought of her kids and step kids first. She is very generous and kind. Mom deserves it because she would never buy anything like this for herself! Always taking care of other first! My mother has raised 7 children. Her youngest son at 19 got cancer and died at 21.Then she lost my father after 49yrs. of marriage. She takes care of my older handycap brother. Then she went threw the fear of me having cancer. She is 93 and really needs mor good in her life. My mom has passed, but I’m a mom. I could use this because more often than not I buy everything for my kids, and don’t think of getting anything special for myself. It would a nice treat, and would definitely ramp up my ‘mom look’. This one is for my wife and the mother of our daughters. She is a true Michael Kors fanatic! My mom is not only an amazing mother but an amazing grandmother and friend. Why does my mom deserves to win this Michael Kors bag? Easy. She has put up with me! Because this bag is fashionable, like her! My Mom (Mother in law) deserves this amazing Michael Kors bag because she’s constantly doing for others, and never treating herself. She’s an amazing woman. My Mom does do much for so many and asks for nothing in return! She’s always smiling, always kind, and most of all, ALWAYS there! Love her to pieces! My Mom deserves this Michael Kors bag because she loves stylish hand bags but has never been treated to a designer one. She is always treating others and like most Moms puts herself last. I would love to see a little sparkle in her eye! Also, she is single…a wonderful bag like this might but a little extra spring in her step and she might catch herself a new love! Because she’s the kind of person who will give gifts to everyone else and never focus on herself. My mom deserves this bag! All her life she was taking care of us kids that she neglected to take care of herself. I would love to win this bag for my mom so she has something beautiful that she can carry around. She has always saved as much money as she could so she could give us great things. She always neglected herself in the process. I would love to give her something beautiful that is her own. My Mom deserves this because she always puts her family before herself. My mom loves handbags and she’s a hard worker for her family. My mom has never owned a great looking purse like this beautiful Michael Kors bag. Any extra funds she would achieve would always go to household expenses or on her children. So my mom really deserves to win this fabulous Michael Kors bag!! Mom deserves to win because she needs a new bag. My mom deserves this prize and so much more. She is always willing to help everyone out all the time. My Mom turned 89 a few weeks ago and she still thinks of others ahead of herself. I would love to present her with this gorgeous purse!